London, Macmillan, 1936. 2 Bl., XII 403 S., Ln., OU. etw. beschädigt, NaV., tls. Anm. u. Anstr. . -- Braeuer 213. Carter, Muir 423. - "... Fellow of King's Kollege, Cambridge" - Erste Ausgabe. - "... the increment of aggregate investment multiplied by the marginal propensity to consume. ..." (123)..
London: Macmillan and Co,, 1936. 8vo, 403 pp. Original dark blue publishers cloth with title to backstrip in gilt, in original grey-blue dust jacket. Some minor foxing to fore-edge, boards edges slightly rubbed, dust jacket price clipped and slightly sun toned; otherwise a very good, clean copy. First edition of John Maynard Keynes masterpiece, which solidified his position and fame as the most outstanding economist of his generation. “The world-wide slump after 1929 prompted Keynes to attempt an explanation of, and new methods for controlling, the vagaries of the trade cycle. First in A Treatise on Money, 1930, and later in his General Theory, he subjected the definitions and theories of the classical school of economists to a penetrating scrutiny and found them seriously inadequate and inaccurate...A national budget, over and above its function of providing a national income, should be used as a major instrument in planning the national economy. The regulation of the trade-cycle...must be the responsibility of governments. Lost equilibrium in a national economy could and should be restored by official action and not abandoned by laisser faire. In 1936...The General Theory...threw the economists of the world into two violently opposed camps. Yet eight years later Keynes was to dominate the international conference at Bretton Woods, out of which came the International Monetary Fund and the World Bank...” (Printing and the Mind of Man, 423). An essential and foundational text to any serious collector, student or employer of economics. Macmillan and Co. Limited. London. 1936. FIRST EDITION. 8vo. (8.7 x 5.7 inches). Publishers dark blue cloth with four blind ruled lines on each board. Spine ruled and lettered in gilt. Aside from previous owners names to the front blank endpapers, a two line note to the first page of text and some occasional light ink annotation and line marking to the margins of just a handful of pages this is a very good copy of the book. Original first issue, price clipped dustwrapper with the correct adverts to the rear panel. Loss to the top and bottom of spine and a few chips to the edges. Some creasing and rubbing to the edges. Overall a very good book in a good dustwrapper. 1936. Macmillan and Co. 1936. 8vo. Original dark green cloth, spine blocked in gilt; pp. [i, advert.] + xii + 403; previous owner's name on endpaper, a very good, bright copy. First edition of the author's greatest and most influential work. It revolutionized the approach to unemployment and became the major framework in the formation of the Welfare State. Macmillan and Co., Limited. Collectible - Acceptable. London: Macmillan and Co., 1936. 8vo Blue cloth hardcover with gold text on spine. 403 pgs. Fair. Small tear to foot of spine. Binding cracked at rear and at p. 16. Pencil underlining. Inquire if you need further information. London: Macmillan, 1936. 1st Edition. Hardcover. very good/fair. 1st Edition. Hardcover. "8vo - over 7¾ - 9¾"" tall" "8vo (215x134 mm). xii, 403 pp. Original publisher's cloth lettered in gilt on spine, in original dustwrapper. Clean pages with no markings or annotations. Endpapers tanned. Former owner's inscription on flyleaf. Slight mould staining to front pastedown. Moderate wear and scuffing to boards, mainly on spine, edges and corners. The lower front edge has some damage on the corner and in the spine region, and crushing to the spine ends. Some bleach markings and dulling to cloth of boards. Dust jacked expertly restored with repairs to chipped and torn paper at upper and lower margin of covers and spine affecting letters. The dust jacket is heavily tanned. Still a good copy. ---- PMM 423. First edition, 2nd printing (March 1936). The most influential work of economics of modern times. Keynes was to dominate the international conference at Bretton Woods, out of which came the International Monetary Fund and the World Bank; and his influence during the ensuing decades, even on his theoretical opponents, has been such that a highly placed American official recently remarked that 'we are all Keynesians today' (PMM 423)." London: Macmillan, 1936. 1st Edition . Hardcover. Fine/No Jacket. 8vo - over 7¾ - 9¾" tall. First edition, first printing of Keynes's most influential book. Single word "Copyright" on copyright page, erratum at the end of p. 403. Sunning to spine. Minor spots to upper board, more significant spots to lower board. No writing, bookplates, library treatments, underlining, or signatures. Slight browning in gutter of first few pages, otherwise text block is fine +++, essentially new. Rarely seen in this condition. London: Macmillan and Co., Limited, 1936. [Economics]. FIRST EDITION. Demy octavo (22 x 15cm), pp.xii; 403; , blank. Publisher's blue-green cloth ruled in gilt and blind, gilt titles to backstrip. No jacket. Mild spotting to edges and extremities, two neat owner signatures to flyleaf (1936 and 1957); cloth a little rubbed and bumped, some minor marks. A very good copy of this landmark work. John Maynard Keynes, 1st Baron Keynes, CB (1883-1946); British economist whose ideas, called Keynesian economics, had a major impact on modern economic and political theory as well as on many governments' fiscal policies. Economists consider him one of the main founders of modern theoretical macroeconomics, and his popular expression "In the very long run, we are all dead" is still quoted. Keynes dominated the Bretton Woods conference out of which came the International Monetary Fund and the World Bank. A highly placed American official recently remarked "We are all Keynsians today". Included within "Printing and the Mind of Man." London, MacMillan and Co., 1936, Or.cloth., 403 pp. Many pencil underlinings and annotations. Inner spine sl. cracked, but binding otherwise strong. First edition February 1936. Reprinted March 1936. A few traces of use to the binding, otherwise in good condition. The second edition of Keynes' major work, printed only a month after the first edition. London: Macmillan and Co., Limited, 1936. First Edition. Hardcover. Very good +. First printing, octavo size, 415 pp. 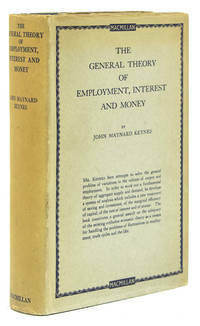 The final and most influential work by acclaimed British economist John Maynard Keynes (1883-1946), "The General Theory of Employment Interest and Money" inspired a vast change in the school of thought of macroeconomics; in the book, Keynes refutes the idea that a completely free and unchecked market would lead to full employment, and his arguments had great influence on government economic policy. The "Keynesian Revolution" soon followed the book's publication, as theories of economics with regards to employment and governments' roles within the markets were reassessed. Keynes moved in intellectual circles such as the Bloomsbury Group, a collection of intellectuals, writers, and artists associated with Cambridge University in England, which included E. M. Forster and Virginia Woolf. This volume is the first edition of Keynes' book, a monumental work that joined Adam Smith's "Wealth of Nations" as required reading in the field of economics. ___DESCRIPTION: Full green cloth, blind-embossed ruled borders on the front and rear boards, gilt ruled borders and lettering on the spine, top edge stained brown; octavo size (8.5" by 5.75"), pagination: [i-iv] v-xii [1-2] 3-403. ___CONDITION: Volume is very good plus, with a strong, square text block with solid hinges, the interior is clean and bright, and entirely free of prior owner markings; the boards are clean overall with some minor soiling to the spine and front board, light sunning to the spine, some rubbing to the head and tail of the spine, the bottom corners are gently bumped, and with extremely slight toning to the free endpapers. We are rating very good plus because of the minor wear to the outside and a small stain to the front board; however, the interior is clean and bright, without wear. ___POSTAGE: International customers, please note that additional postage may apply as the standard does not always cover costs; please inquire for details. ___Swan's Fine Books is pleased to be a member of the ABAA, ILAB, and IOBA and we stand behind every book we sell. Please contact us with any questions you may have, we are here to help. London: Macmillan and Co., Limited, 1936. First printing hardcover. This is an ex-university library book with the usual markings. Otherwise, the book is good with written notations and underlining to shelfwear, bumped corners, 7 pages in the early part of the book with underlining and/or written notations to probably almost half the pages (mostly in pencil, but some pen), just a bit of highlighting, the last blank page removed and a 1/2" tear to the bottom of the spine. There is no dust jacket. A good example of a scarce book.. First Printing. Hard Cover. Good. Ex-Library. Norwalk, Connecticut: Easton Press. 1995. First Edition; First Printing. Hardcover. Fine, Accented in 22kt gold, printed on archival paper with gilded edges, smyth sewing & concealed muslin joints. Bound In full leather with hubbed spines. Pristine. ; Books That Changed the World. ; 8vo 8" - 9" tall . New York: Harcourt, Brace & Company, 1936. First Edition. Hardcover. Good. Good, lacking the jacket. Blue buckram, rubbed at the corners and head and foot of the spine. Bound with a touch of reading wear and a slight forward lean. This copy bears the ownership inscription of Bertrand Fox, professor emeritus at the Harvard Business School. A classic work of modern economics that emphasizes macroeconomics and introduces the idea of the consumption function. London: Macmillan and Co., 1936.. Second impression, 8vo, (ii), xii, 403, (1) pp. Bookplate to fly leaf. Original gilt titled cloth, spine very slightly sunned otherwise an excellent copy. First published one month before. 2010-03-09. New. Ships with Tracking Number! INTERNATIONAL WORLDWIDE Shipping available. Buy with confidence, excellent customer service! Thieme, 2015. .. Brand New. Orders usually ship within 1-2 business days. We use FAST SHIPPING via FEDEX/UPS/DHL and deliver within 3-5 business days with tracking number, no shipping to PO BOX, APO, FPO addresses. Kindly provide phone number for expedite delivery. 100% Customer satisfaction guaranteed!